The first day of the Symposium had registration, an exhibition opening and welcome speeches etc. The second day was pretty much all the talks in 2 concurrent sessions. Luckily we were all issued great big conference proceedings books because we missed a lot. Most speakers tried to do their talks in English but a large part of the audience were Chinese or Japanese. Simultaneous translation was too expensive so there was a little catchup at the end for non-English speakers which must have been very frustrating for them. A few talks were in Mandarin or Japanese and it really made me realise how important it is to have great images on the screen if you don't understand any of the talk. One speaker did his whole talk in Mandarin and his only image was the title of the talk (also in Mandarin) so I still have no idea what he was talking about. I enjoyed most of the talks but the demonstrations and mini workshops were my favourite. Unfortunately I missed most of the demonstrations as they were the same day as the trunk show. My favourite was a mini workshop on Lazer engraving on fabric. This was lead by PhD student 'Carson' (Guoxiang Yuan). Carson also won at least 2 prizes in the exhibitions for some amazing work using the laser engraving. Here are some images. The jpg image is loaded into the laser computer and re-sized then the piece of clothing or fabric is put onto the bed of the laser 'cubicle?'. 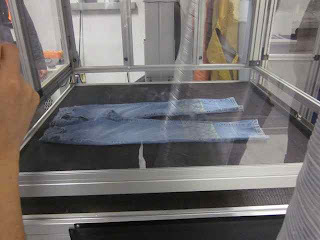 In this picture the laser is engraving the jeans across both legs at once. 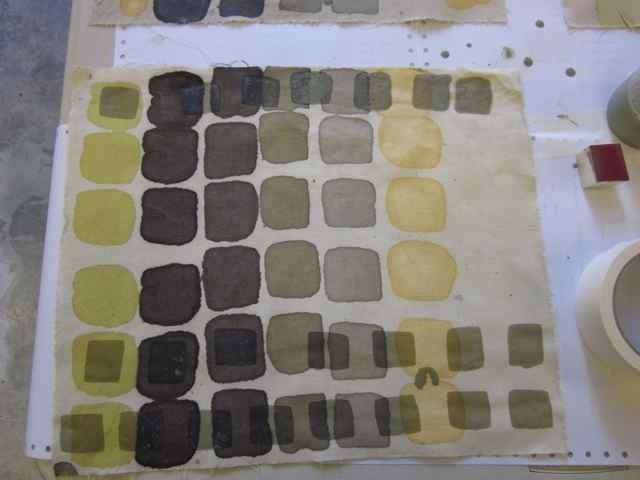 It is removing the colour from the fibres rather than the top layer of fabric. Here is an example of a students laser engraved design. 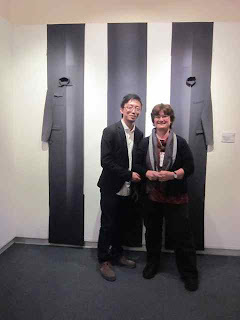 Here I am with Carson in front of his winning work in the Energy Nexus exhibition. 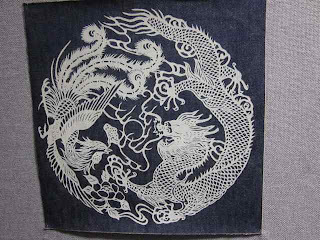 The paler areas are made with laser engraving. This method can be used to simulate worn areas on clothing such as jeans much quicker and without use of so much handling, water etc. Look out for Carson I am sure he is going to go far! Another workshop I really enjoyed was with Michel Garcia. 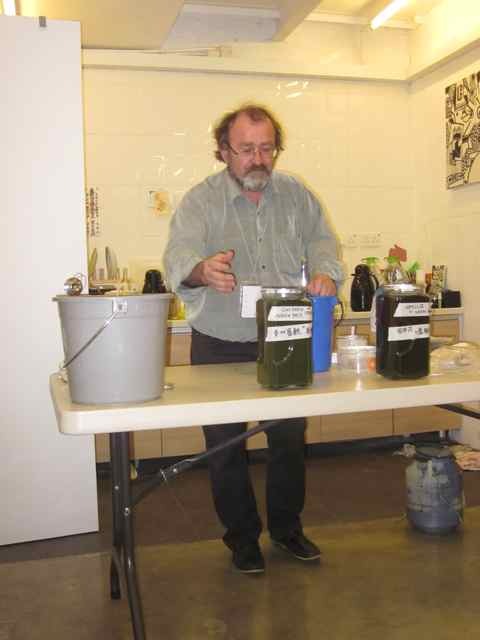 He teaches natural dyeing from a chemist's point of view. He explains why you need certain chemicals and uses non-toxic (often plant based) replacements for most of the dangerous chemicals used previously. I highly recommend his class to anyone who gets a chance to attend one of his classes on indigo or tannins. I love the idea that I can make an indigo vat with indigo, fructose and lime. Or Indigo, natural henna and lime. Or even indigo, ripe bananas and lime. Michel Garcia demonstrating how to make two different Indigo vats using henna powder in one and fructose in the other. 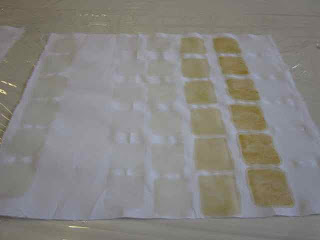 Then over dyed with crushed, cooked pomegranate flesh and skins. Each mordant takes up the colour from the pomegranate differently. I will make a link to some websites for Michel Garcia's workshop when our internet is not as slow. I think the kids have pushed the broadband over the limit for today! 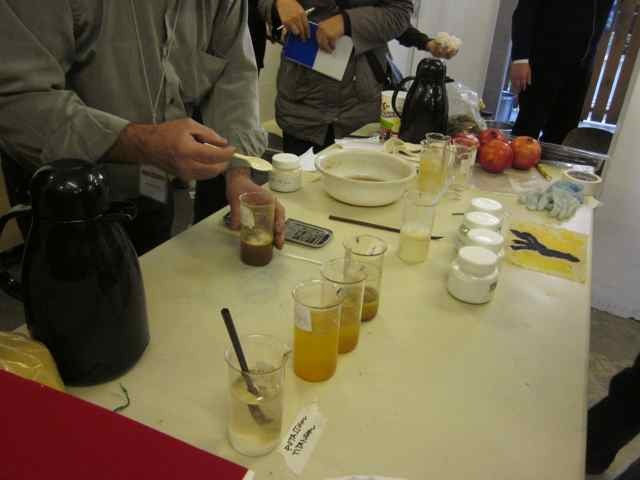 I also went to a demonstration/talk by Mr Hiroshi Murase, about Persimmon juice which is used in Japan as a dye and is called kakishibu. 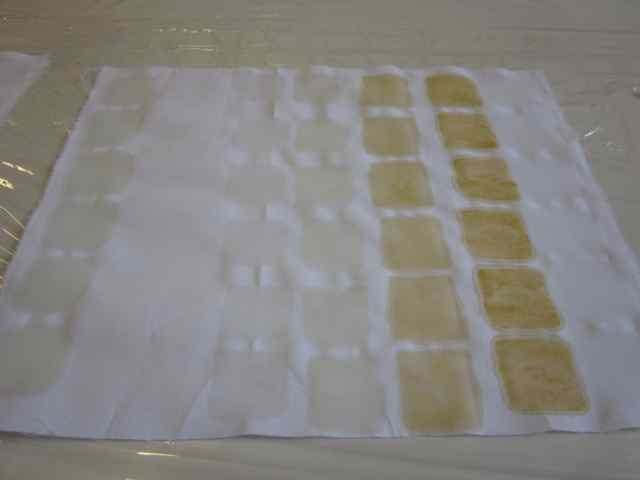 It not only fixes to the fabric with no mordant but can also be used to waterproof things. It reacts to UV so instead of going paler in our high NZ UV, it would go darker. So if anyone in New Zealand - probably in the North - has a source of green persimmons (maybe they fell off your tree in a storm) please let me know! 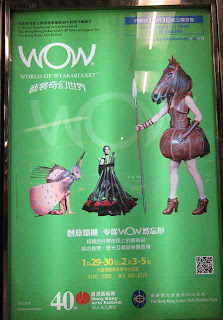 Lastly for the day - WOW is going to Hong Kong. 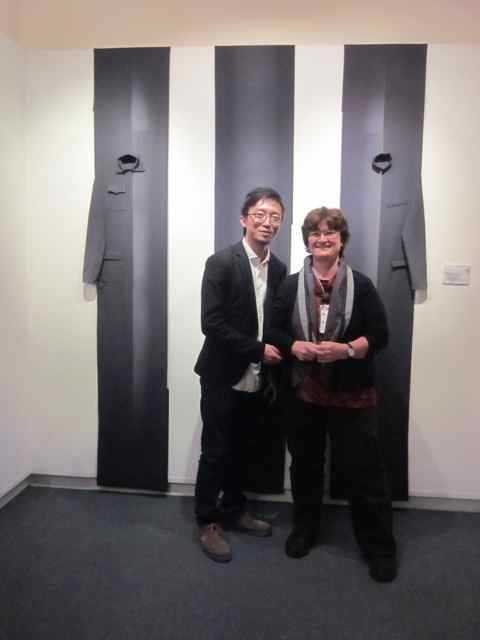 A highlights show is going to the Hong Kong Arts festival. 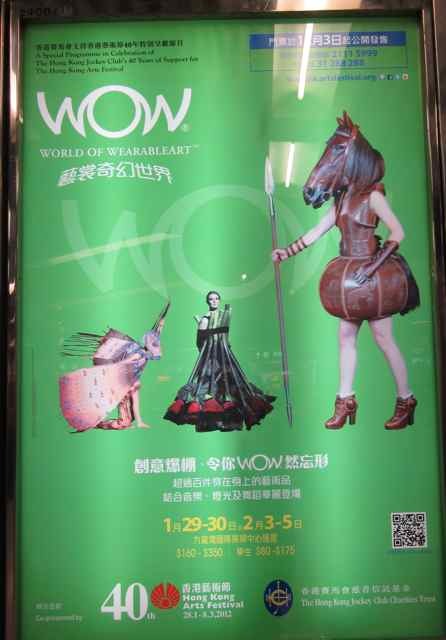 The posters were up in MTR stations. These posts on your recent trip are fascinating Clare - you clearly had a fun and very stimulating time.